Done with active shield tanked Maelstrom 1060 hp / 5 secs, Alt there with Raven for extra dps which good because they close very fast. Too fast for arty to be effective so I used medium drones and Fury II missiles on the Raven to take them down but they did get my shields to 50% on the Maelstrom. Potentially dangerous mission so prepare well. Pocket 2-Pirate base; Inital dps isn't that bad. No problem tanking this one. As stated above the 2nd group will not aggro until fired on and no drone aggro. 2nd pocket is much easier. 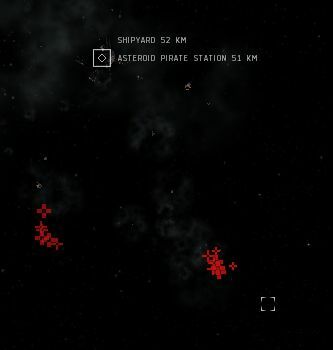 I met 7 BS total in the patrol area but all ships were some 30 to 40 km away, easy if you go for the scrammers first. DPS were no problem with my Vargur (EFT rates it 425 tank against Mercs). Turn on the AB, orbit at some 5 km, blast away with your ACs, watch them go down. After targeting any frigs first, no problems in a AutoCannon Machariel. This was a very easy mission for me in my arty equipped shield tanked machariel (1400mm scouts, LSBII, InvII, Heat & Kin Amp IIs). I never got below 80% shields and did not need to use my shield booster. The mach can do over 500m/s with a T2 AB, so its easy to get some decent range fast. Just over 2k m3 loot with about 800 of than in cap boosters and scraps. I got a 9.375% standing increase with Minmatar. Was worried about the patrol pocket incoming dps/tanking after reading some of the descriptions - didn't need to, was very easy in a mainly T2 fit AB HM Tengu - just burn away, take out scrammers first and snipe rest. 2nd pocket even easier just kill each group separately. Very easy mission if you have an amazing T2 BS... not surprised. For the rest of us, my decent Apoc could NOT come close to tanking the cloud damage. In the Patrol room, it was a lot easier for me when I killed the frigs and then the BSs (leaving the cruisers for last). Still had to warp out once; the incoming damage with 2x Therm and 2x Kin armor hardeners was pretty high at close range until you take out some BSs. pocket 1b (patrol area) done in cnr. 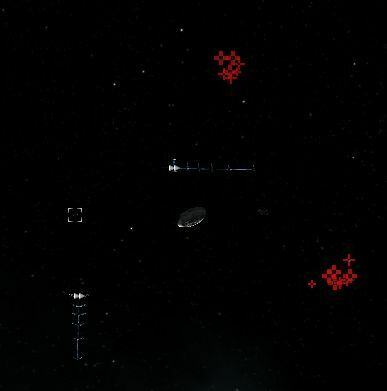 got drones out the second warp stopped. Done cruisers 1st the BS's 2nd shield droped to 47% no less. DPS from the acidic cloud is 150 dps per damage type before resists (Crucible 1.1). Finished in my Tengu. My tank is only a sheild booster&Amp and a good faction kin hardener. all my other modules are strictly dps related. painter webs ballistic controls and such. I took out the vipers then caracals then moas and bs's last. If it were just bs's I wouldnt have even needed to use my sheild booster. Only frigate and cruisers seem to be able to hit my speed tank. Pretty heavy dps coming from very few cruisers. I find this mission about 2x as hard as damsel. Though damsel I find extremely easy. Very easy in a TII passive fit Rattlesnake 20 minute missions sucky bounty 4.4mil, Loot yep your normal mercenary stuff.. good standing gain.. 25% Corp standing - 9% Faction standing. Did this in a T2 armor tanked Tempest. VERY tough even with an AB in patrol pocket 1b. Frigs were the first to die ( got to get rid of that web/scram asap ). Had to pulse the T2 repper. Rest was cake. Finished in an arty Sleipnir via the patrol area route. Got moving asap to get the frigates with guns vs. drones, shot cruisers from snipe range, and speed-tanked the battleships. All ships were surprisingly easy to take down; nothing hurt my shields more than a single boost's worth. Loot (1060m3) was quite good, though salvage was not. Suspect getting dual webbed would have been a Bad Thing, so be ready on that afterburner. Went in with a T2-fitted Golem, X-LSB II + 3 hardeners. First tried the patrol pocket with resists of 0 EM, 50 Expl, 76.3 Kin, 85.9 Therm. Had to warp out twice but it was doable. Frigs didn't seem very eager to web, and I had no scram at all, so it was quite easy. Can confirm that initial distance to the enemy varies. After getting the hostages I tried the acidic cloud for fun, with resists of 72.4 EM, 74.1 Expl, 72.8 Kin, 68.95 Therm. Damage was a bit too much for that tank - no problem short-term but flying 33 km without AB under these conditions is risky. Apart from the toxic-fart-part of the mission, it's a swift run in the park with a decent omni sleip - a good omni passive rattle will do the trick aswell, but the new drone aggroing makes it frustrating. the cloud does ~600 DPS, 150 to each damage type per second before resists. with armor resists of 74, 66, 66, 52%, i took 72+52+52+40 damage per second. if you can tank the cloud, then you drop near a structure which can be looted directly like a cargo pod, without needing to engage the hostiles in the 2nd pocket. Ran this mission with a T2-fitted shield-tanked Ishtar (post-nerf). Easy mission – no significant issues in any room. After killing the rats returned to try the toxic cloud – the tank deteriorates steadily, but time is more than sufficient to reach the gate with MWD. All the years playing this game and I just got this mission. If you have a Golem, the Patrol side is a piece of cake with a Bastion module and an active tank. A bit overkill, I know, but after reading all the comments, I figured I would tank up for it. Even with the bastion, I did get a little blip of red for a bit on my shields in the Patrol pocket. Next time I won't be using it. I had 1 therm and 2 adaptive hardners, as well as an x-Large gist X-type SB with a navy amp.